With the new year starting, it seems that everyone (including myself) is looking for ways to get organized. This laundry pedestal is a great start for your laundry room. My husband and I built this a year and a half ago for our new washer and dryer. There are a lot of oddities with our house (I could go on and on), but one of them is the size of our laundry room. At first glance, it’s a good-sized laundry room. Unfortunately, the space where the washer and dryer go is actually very narrow. Our old washer and dryer used to stick out so far that we could just barely close the laundry room door. Our dryer vent hose was at an angle that probably wasn’t ideal. My husband had wanted to purchase those expensive drawer pedestals for years, but we just couldn’t justify spending hundreds of dollars on them, and we didn’t know what we would put in those drawers. When I showed him these plans from Ana White’s website, he was totally onboard with building our own. We also happened to need a new washer and dryer at the time, so we went on the hunt for those as well. Because of the location of our dryer vent in the wall, we had to find a dryer that could have the vent hose attached on the side. We searched for weeks and happened to find the perfect set at the Best Buy near our house. It was closing, which we hated, but it also meant that we got an awesome deal on the pair. We got all of our materials for this project at Home Depot. The laundry pedestal cost us around $125 to build. That’s less than purchasing one pedestal! You can find detailed instructions for these plans here. 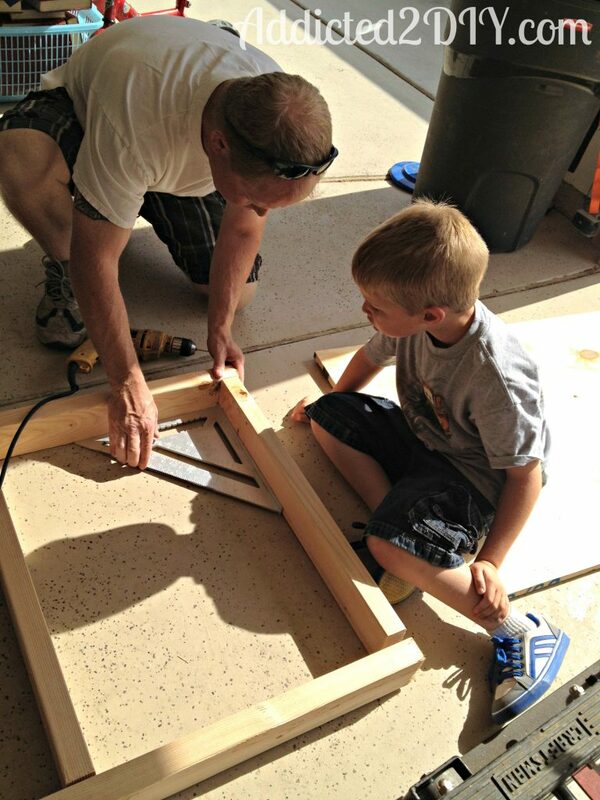 We started by building two frames. The top frame (the one that the washer and dryer sit on) will have more center supports than the bottom frame (pictured). We squared everything up and screwed the frame together with 3″ wood screws. If you have a Kreg Jig (which we didn’t have at the time), you can also drill 1 1/2″ pocket holes and attach everything with 2 1/2″ pocket screws. We cut our plywood pieces to size and snapped some chalk lines, then screwed them down with 1 1/2″ wood screws. I got caught up in the moment and didn’t take any pictures of the next few steps. After the two frames were done, we attached the 4×4 pieces following the plan instructions and then filled all of the screw holes with wood putty. The wood soaked up the paint like crazy, so we used two coats to paint the whole pedestal. After painting it, we attached the trim pieces with caulk and finish nails and then painted those as well. We couldn’t wait to get the pedestal in our laundry room. I got the laundry baskets at Walmart and then I used some vinyl to cut letters out to label the baskets. The best part is that my kids now sort their own laundry! It makes my life so much easier to be able to ask them to do that before I start a load. Plus, we now have a place to put dirty towels as well. Plus, I can just prop the big laundry basket right up to the dryer and take clothes out. I seriously love this thing. We’ve actually made a second one as a gift for friends and they love it too. As always, if you have any questions about the project, I’d love to answer them. If you are thinking of buying those expensive pedestals, this option, in my opinion, is so much more functional. Please feel free to share, pin, like, etc!